When it comes to hair, there's one brand that never fails to impress me. That brand is Kerastase. The first time I was introduce to this brand was at David's Salon in Sta. Lucia East Mall. My family home was just across it and my mother frequented that branch for her haircut, rebonding and hair coloring. Back then, I had severe dandruff problem. And when they offered my mom to purchase their anti-dandruff line, she bought me the shampoo and conditioner. It was expensive so my mom asked me to use it properly. Within 5 days of using Kerastase Bain Gommage, my dandruff disappeared like magic. What's great was that it didn't dry out my hair compared to regular mass brand anti-dandruff shampoos. I didn't know exactly what a prestige brand Kersatase was. What I knew was just it was great! So even when I learned the ropes of taking care of my hair and when I have extra budget, I look to Kerastase for intense hair care. Right now, I use Kerastase Oleo Relax Slim Masque for my rebonded hair, Bain Chroma Rich Masque and Chroma Sensitive for to maintain the color. But applying them can't be done at one time. What I do is deep contion my hair with the Oleo Relax Slim on Sundays and the Chroma Rich Masque or Chroma Sensitive on Saturdays. It takes a lot of my time for sure since deep conditioning needs about 20 miuntes of more for you to see fabulous results. It's a good thing that Kersatase came up with a new invention! And they call it Fusio-Dose. It's a first of its kind and it targets everything your hair could possibly need. 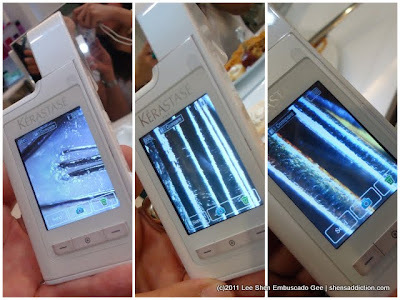 The idea of Kerastase is to provide the hair with a healing treatment with immediate results. Fusion of the Concentrate (those in the bottles) and Boosters (Caps with intense ingredients), when combined together creates a tailor-made hair treatment that targets all hair damage. Kerastase makes it easy to spot your Primary and Secondary need with this ingenious slide tablet. Fusio dose Primary Need Concentrates and Secondary Need Boosters. Now, time for my hair analysis. Don't you often feel hypochondriac when it comes to your hair? That you often think that you have the driest, worst hair compared to others? I'm like that. With the Kerastase hair analyzer, I discovered that my hair is a somewhat healthy after all. It's dry where it's suppose to be from rebonding and hair coloring, but my hair cuticles aren't as bad as I thought it was! Thank God for nifty gadgets like this! Given that my hair's primary need is rebonded and colored but incredibly thick and dull from outside stressors, I was recommended Double Nutri-Huile for Instant Nourishment and Softness. Amped it up with twice the dose of Ionium + Argine Booster for In-depth nourishment and Polyphenols + Ionium for protection of coloured hair. Here's a video on how the Primary Need Concentrate and Secondary Need Boosters are mixed. After everything is mixed together, this is how it looks. Such a tiny but powerful product! The cap is then replaced with a sprtizer cap and applied to your hair from roots to the tips. Then, a head massage follows. There's no need for heating or hot machine to infused this treatment on to your hair. It's very safe and really nourishing for your locks. after 20 minutes, your hair is then washed off of the fusio-dose and then you're ready for blow dry. Immediately, I felt a difference even with my hair wet. It felt lighter lighter and easy to untangle. Having had unmanageable hair for half my life, I know when its behaving...this time it certainly was! To prep for the blow-dry, Kerastase Nectar Thermique was applied on my hair to protect it from the heat. This also gives added shine and nbourishment to my hair. Sleek, softer, shinier looking hair.... It's Kerastase. Enough said! Fusio-Dose ritual starts at Php1500 at David's Salons, depending on your hair thickness and length. And it takes only about an hour. Great to grab one during lunchtime or after work if you don't want to deal with traffic just yet. I suggest not to wash your hair the next day to let the treatment seep into your hair better . The results are still visible after 7 to 9 washes (5 to 6 if you wash your hair daily). But the dryness of the hair will be forever reduced! Since I use products that targets my hair concerns, along with the Fusio-Dose, my hair looks a lot healthier and softer. No more frizz and tangles. And the weight of my hair certainly lessened that I didn't feel the need to frequently ponytail it. I got to meet Laura Charlton, daughter of David of David's Salon. At such a young age, she's very accomplished! She confesses that she's not a natural blonde but her hair is kept soft because of treatments like Fusio-Dose! She even says that we Filipinas have more care for our hair as we frequently get hair treatments done to maintain its softness! :) Yes, Laura, Filipinas take good care of themselves inside and out! Ang shiny na nga ng hair mo after sisterhood! :) Ang ganda! ang ganda ng effect sa hair mo!! super!! Does David's Salon sell Kerastase products as well? I've been looking for Nectar Thermique and I don't know where else to purchase it. Thanks! how much yang kerastese rebonding? hi po.ang ganda ng naging outcome.mine's really frizzy din po.rebonded sya before pero lalo lang nasisira.naghahanap ako ng pwedeng treatment ng magrerestore sa hair ko.will this treatment last for days?or if naligo ka wala na ung effect nya.baka balik frizz na naman the next day.kasi yung hair ko matagal ng hindi rebonded so talagang frizzy sya.gusto ko marestore sa dati nyang look.